Gold. It’s more than a currency. It courses through history. It’s the drive behind explorations, the growth and decline of markets and nations, and centuries of change—and its allure remains. It’s also a physical commodity that you can hold in your hands. So how does investing and trading in a precious metal like gold work in an increasingly digitizedworld? With a highly fragmented worldwide physical gold market, the answer is complicated. The team at Tradewind Markets believes there’s a better way to manage the ownership of gold by using cloud-based technology solutions and blockchain's distributed ledger technology (DLT) to simplify processes, increase transparency, and open up new opportunities. Due to the universality of gold’s value and its relation to the mainstream financial market, stakeholders in the gold industry have pain points for which blockchain solutions bring tremendous value. 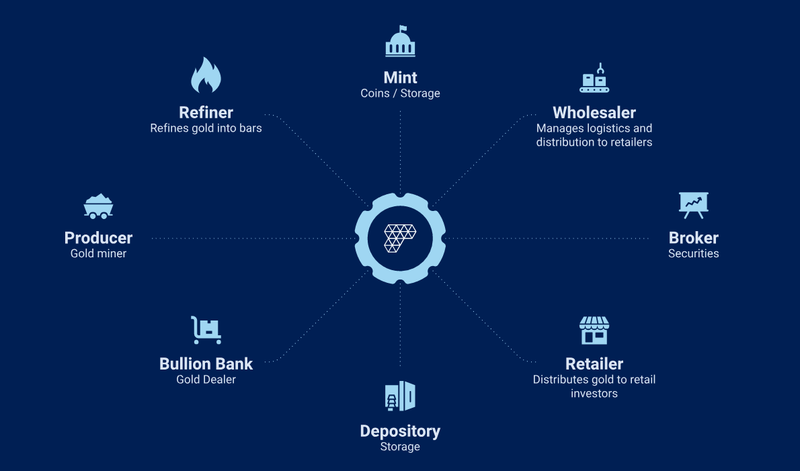 “Gold market stakeholders, including bullion banks, investors, and custodians, share common goals to modify post-trade risk, increase transparency, standardize frameworks, and experience more efficient and cost-effective transacting processes,” says Abishek Kumarasubramanian, lead architect at Tradewind. Tradewind Markets envisions building a new ecosystem with the VaultChain Platform. The team began engaging with forward-thinking stakeholders in the gold industry, including the Royal Canadian Mint, to discuss potential commercial use cases for blockchain. In the process, it researched many cloud and blockchain technologies, ultimately choosing to build a blockchain platform using R3's Corda platform on Amazon Web Services. After deciding to build a private blockchain application, Tradewind selected R3’s Corda platform due to its ability to isolate data, offer privacy, and provide a developer-friendly technology. “The entire technology team was comfortable using theCordaplatform. Its documentation, APIs, Slack channel, and support were beneficial as we developed the initial platform,” says Kumarasubramanian. 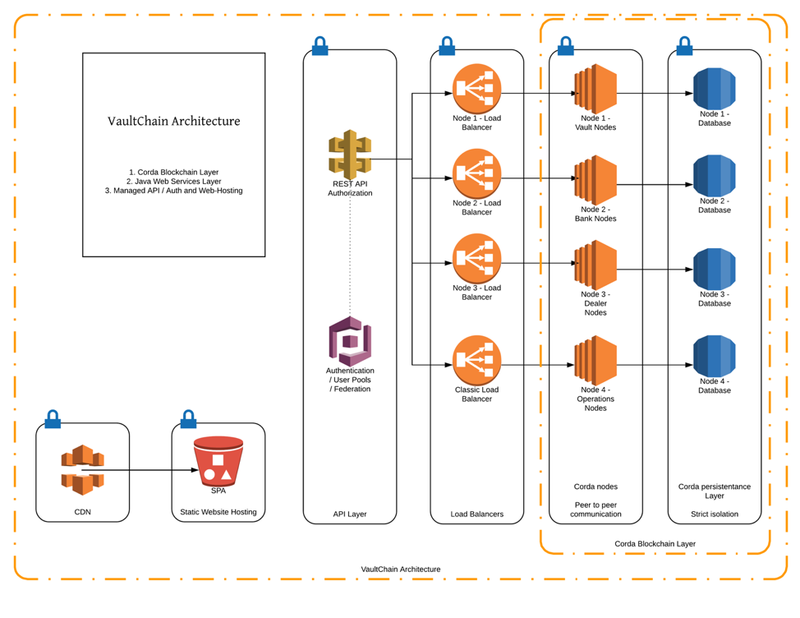 The VaultChain architecture on AWS. “Our AWS architecture is extremely distributed,” says Kumarasubramanian. Tradewind uses many AWS services to run its application, including Amazon Relational Database Service (Amazon RDS) for its databases; Amazon Cognito for authentication management; Amazon API Gateway to create, publish, maintain, monitor, and secure APIs; Amazon Elastic Compute Cloud (Amazon EC2) for on-demand compute capacity; Amazon Virtual Private Cloud (Amazon VPC) to launch resources in a private and isolated network; AWS Certificate Manager to provision, manage, and deploy private SSL/TLS certificates; and Amazon Route 53 for DNS support. The platform is accessible to customers by using a REST API. “We’ve built a platform to remove existing limitations and empower different parties to transact and settle between each other in new ways,” says Haughton. The platform is initially in use with gold dealers in North America but is designed to take advantage of the AWS global reach and eventually operate on a global scale. To learn more about Tradewind, click here. For more information about the launch of VaultChain, click here. To learn more about how Tradewind Markets has created a digital solution for the physical precious metals market using exchange technology with a tailored blockchain application, check out their website here. 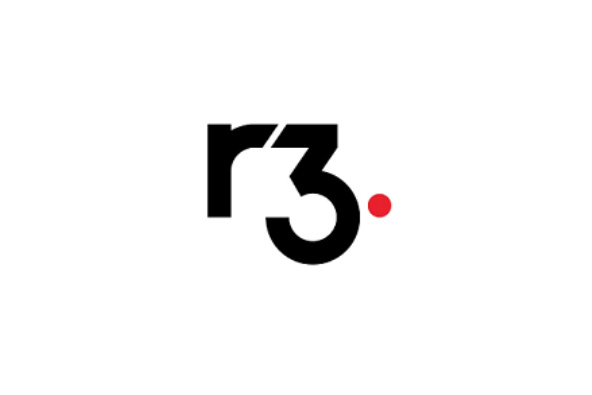 R3 is an enterprise blockchain software firm working with a broad ecosystem of more than 200 members and partners from both the private and public sectors to develop on Corda, its open-source blockchain platform, and Corda Enterprise, a commercial version of Corda for enterprise usage. The Corda platformis already being used in industries from financial services to healthcare, shipping, insurance and more. It records, manages and executes institutions’ financial agreements in perfect synchrony with their peers, creating a world of frictionless commerce. Learn more at r3.com.